The Well-Read Redhead: We NEED to talk about The Walking Dead COMICS! Hello, reader friends! As I mentioned last week, I have recently delved into the comic book world of The Walking Dead by Robert Kirkman. I've been watching the TV show on AMC for quite some time, and I always knew there was a comic series, but not being much of a comics fan, I didn't see the need to seek them out. Now, as Season 6 of the show has taken me on a wild roller coaster of flesh-eating-zombie emotion, I've found myself more and more curious about the comics that the series is based upon. It's hard not to hear fans comparing the show to the comic fairly constantly, and so I finally decided to make some time to check them out myself. OH MAH GAH. I am HOOKED. Why didn't I start these up sooner??? I am reading the comics as "compendiums", which are basically huge collections of a lot of issues of the comic (makes it much easier than having to hunt down each individual issue). 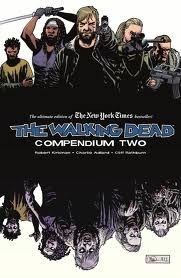 There are 3 TWD compendiums currently, and my local library system has the first two (I'm currently on the second). 1. It's interesting to see the origins of TWD: the initial tone, the motivations of each character, etc. I've found that in some parts, the comic is WAY more campy than the show. In other areas, the intensity and violence is far beyond anything you've seen on TV. It's cool to read it one way after having watched it another, and dissect why there may have been differences created between the two. Oh, and there's no Daryl in the comics. I KNOW. 3. With books, the common mantra is "the book is always better than the movie." In TWD, I don't think you can necessarily say that the comic is better than the show, or vice versa. The comic certainly has been able to do some things that the show can't, especially when it comes to toeing the line with violence. But the show does just as good a job of delving into each character's background, and hitting the primary high points of the comic's story line. Comparing and contrasting these two mediums based on what they can provide is fun brain food. Basically, this entire post is a push to all you TWD TV fans to get out there and READ the darn comics, if you haven't already. If you think you'll be bored because you already know what happens...trust me, you are wrong! Yesssssssssss!!!!!!!! I'm working my way through Compendium 3 now and I agree with all the things. Both versions are totally worth experiencing and the differences don't hinder my enjoyment of either one. As far as my two choices for survival partners, that's tough. Michonne probably for one because she is a complete badass in both the show and comics. 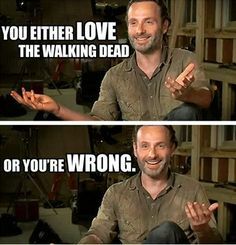 And... Glenn is my fave but I can't bring myself to split up Glenn and Maggie nor do I want to be their third wheel. So probably Daryl. Daryl and Michonne. Not much for conversation, but they'd keep me from being eaten. Probably. Who am I kidding? I'd have died way early on. And I have to admit Glenn is not my favorite, though he did work his way a LITTLE bit into my favor after the whole dumpster thing. No Daryl?! And Carol is different?! I'm so intrigued!! I HAVE to get to these soon! Oh mah gah. Carol could not be MORE different. It is hilarious.